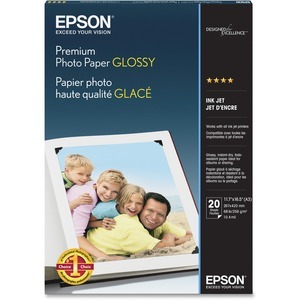 Premium Glossy Photo Paper has a high-gloss finish that is perfect for printing your favorite cherished photos and enlargements for glass frames and photo albums. Smudge-resistant and water-resistant bright white, resin-coated stock offers the look and feel of traditional photographs. 68 lb. 10.4 mil thickness. 11 45/64" x 16 1/2"